Tip the couscous into a bowl, pour the boiling stock over and mix well with a fork. Cover with a plate and leave for 4 minutes. Meanwhile, tip all the dressing ingredients into a bowl and mix well. Fluff up the couscous with a fork, stir in the chickpeas and follow with half the dressing. Mix well and pile on to a large serving dish. Heat 1 tbsp oil in a large frying pan and fry the courgette slices over a high heat for 2-3 minutes until dark golden brown. Lift out on to kitchen paper. Now put the tomatoes cut-side down into the pan, and cook for another couple of minutes until tinged brown on the underside. 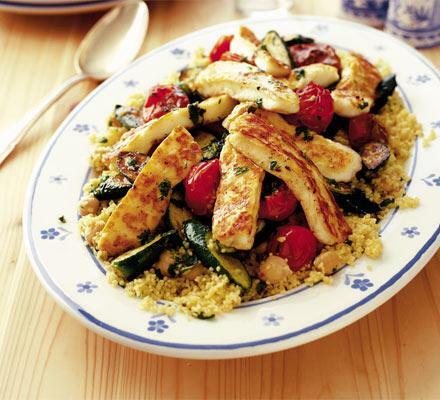 Top the couscous with the courgettes and then the tomatoes. If the pan is dry, pour in a little more oil and heat it up, then add the halloumi strips and fry for 2-3 minutes, turning them over from time to time, until crisp and sizzled brown. Pile on top of the tomatoes, and drizzle with the remaining dressing. Serve as soon as possible.